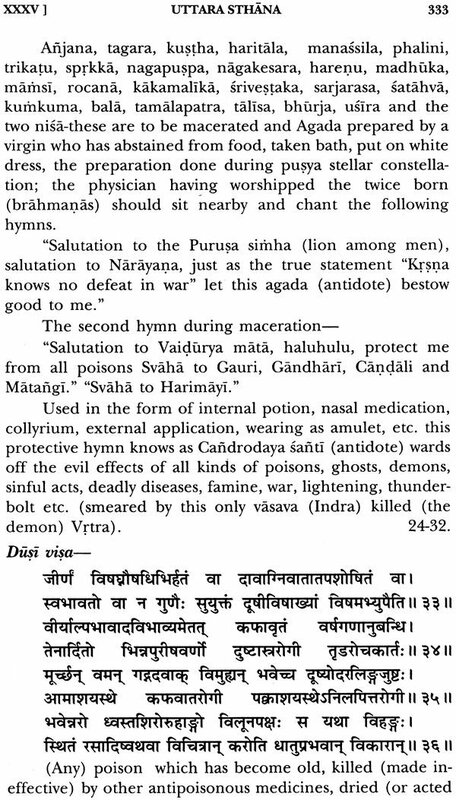 Astangahrdaya of Vagbhata is an ancient authoritative treatise on Ayurveda. Its popularity extended beyond the frontiers of India for more than a Thousand years is substantiated by its translation in Arabic, Tibetan and of course of some European languages. None of these are available now. 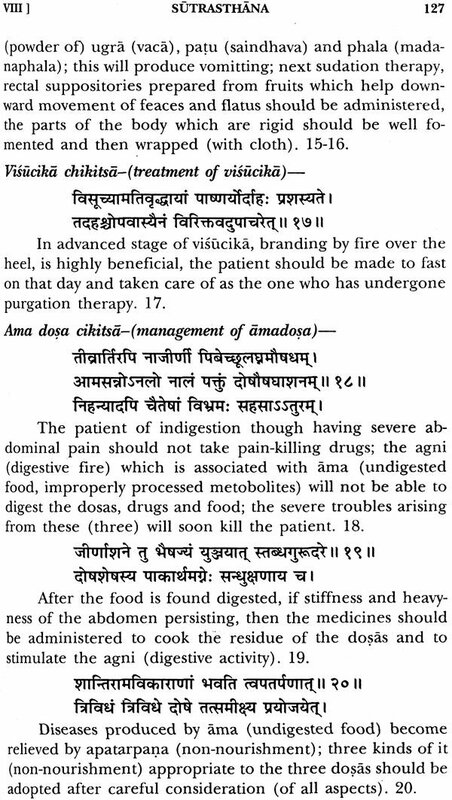 Study of Astangahrdaya is considered indispensable for a through knowledge of Ayurveda. 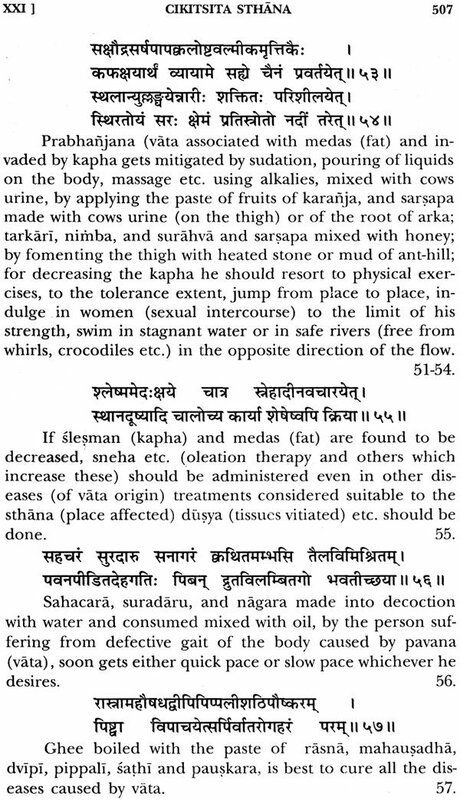 With the increasing interest these days for the study of classical texts of Ayurveda both within and outside India, a great need is felt for an English translation. This publication hopes to fulfill this necessity. The complete text is being presented in 3 Volumes viz. 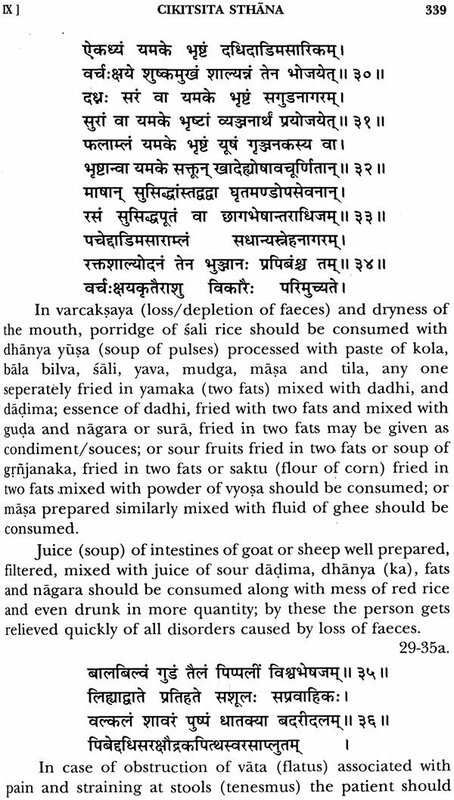 Each volume has the text in Sanskrit, followed by its faithful English translation. Explanations wherever necessary are furnished in the Notes. Appendices and Index are provided to make each volume self-reliant. This great work on Ayurveda, translated by an experienced professor, published for the first time in sure to be of immense help for all those who are interested in Ayurveda. Prof. K.R. Srikantha Murthy (b, 1929) an alumnus of the Govt. Ayurveda College, Mysore (1948) and Post-graduate Centre in Ayurveda, Jamnagar (1958), served as Professor and Principal at all the three Govt. College of Ayurveda in Karnataka and retired in 1984. As ordained by his Preceptor and mentor, Prof. C. Dwarakanath, he has been pursuing literary research activities since last thirty five years and has so far published many scientific papers and books. 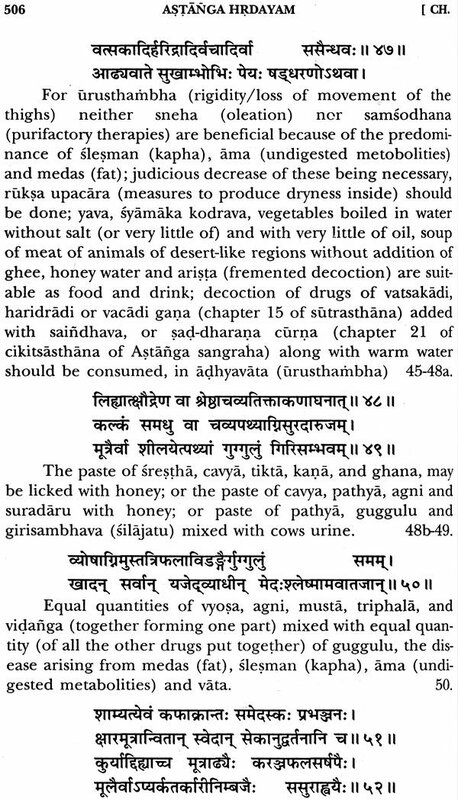 Astangahrdaya-quintessence of the eight branches (of Ayurveda) is one of the authoritative treatises on ancient Indian medicine. It had attracted the attention of medical men not only within this country but also of neighbouring countries such as Arabia, Persia, Tibet and Germany. Its popularity is substantiated by the large number of commen- taries by Indian scholars and appreciation by the scholars of many other countries. 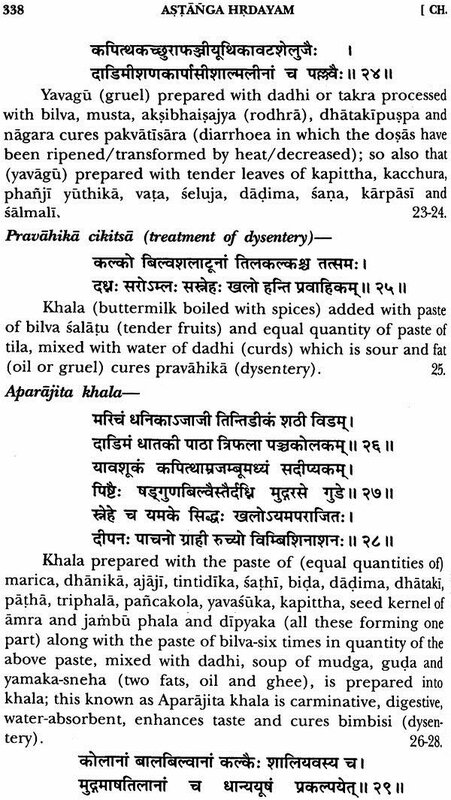 With its beauty and brevity of poetical composition, sequential arrangement of topics, clear descri- ption of precepts and practices of medical science and many other merits, it has earned its rightful place as one among the 'Brhat trayi' -three great treatises-of Ayurveda. It is an epitome of Ayurveda catering to the needs of the students, scholars and medical practitioners alike. 1. 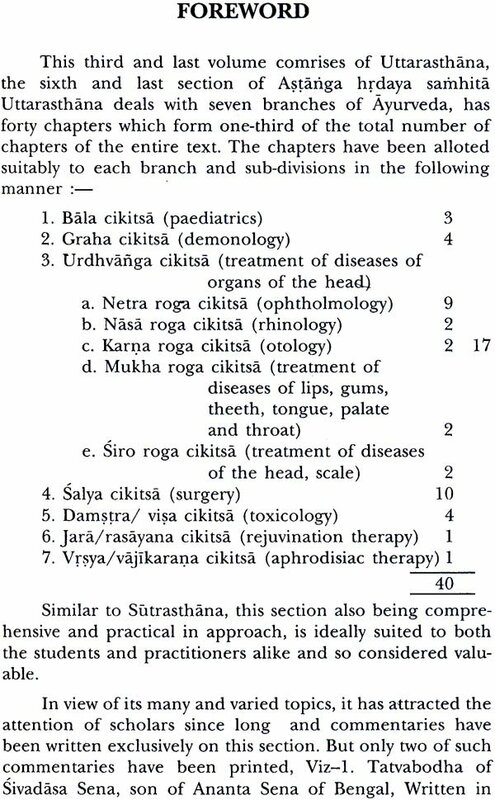 Sutrasthana : The first section has 30 chapters dealing with basic doctrines of Ayurveda, principles of health, pre- vention of diseases, properties of articles of diet and drugs, humoral physiology and pathology, different kinds of dis- eases and methods of treatment. 3. 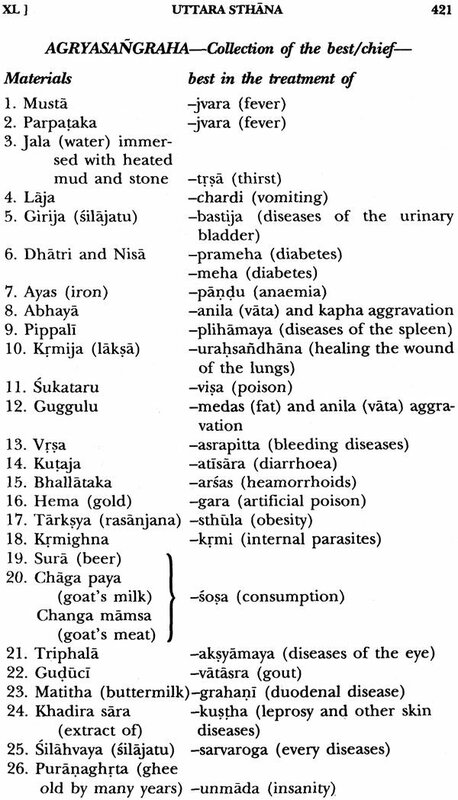 Nidana sthana : The third section with 16 chapters describes the causes, premonitory symptoms, charectorestic features, pathogenesis and prognosis of some important dis- eases coming within the realm of Kaya cikitsa (inner medi- cine). 4. 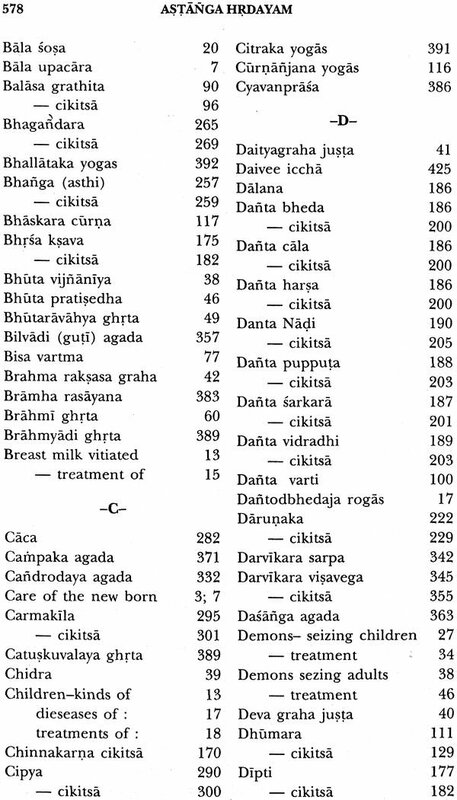 Cikitsa sthtana : The fourth section has 22 chapters elaborating the methods of treatment of all major organic diseases, including efficacious medicinal recipes, diet and care of the patient. 5. 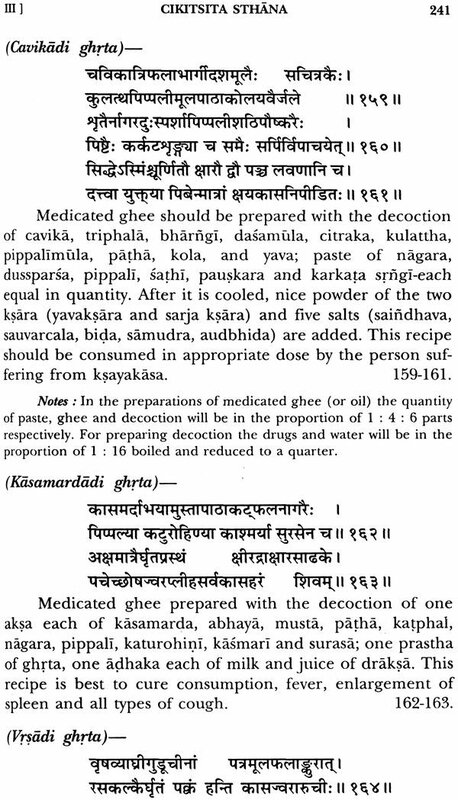 Kalpa-siddhi sthana : The fifth section has 6 chapters dealing with preparation of recipes, administration of puri- ficatory therapies and management of complications; and principles of pharmacy. 6. 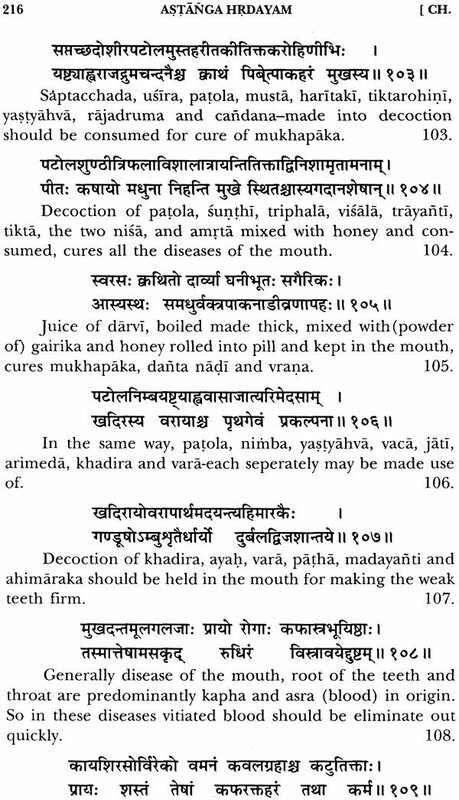 Uttara sthana : The sixth and the last section is de- voted to the remaining seven branches of Ayurveda. It has 40 chapters in total; divided as follows, viz. 3 for Bala cikitsa (paediatrics), 4 for Graha cikitsa ( demonology/psychiatry), 17 for Urdhvanga Cikitsa (diseases of organs in the head) sub-divided again-9 for netra cikitsa (ophtholmology), 2 for karna cikitsa (otology), 2 for nasa cikitsa (rhinology), 2 for mukha cikitsa (mouth, teeth and throat), and 2 for siroroga (diseases of the head ). 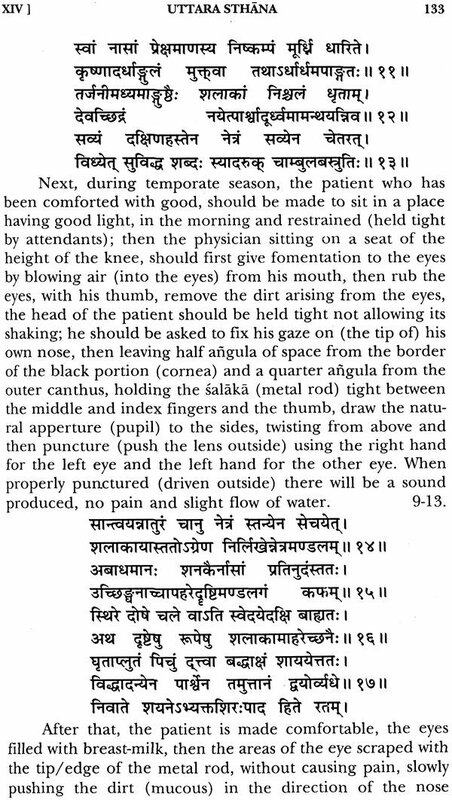 Salva cikitsa (surgery) has 10 chap- ters; Damstra (toxicology) has 4; jar a cikitsa (rasayana) , (rejuvination therapy, geriatrics) and Vrsa (vaji-karana (virilification therapy, aphrodisiacs) have one chapter each. 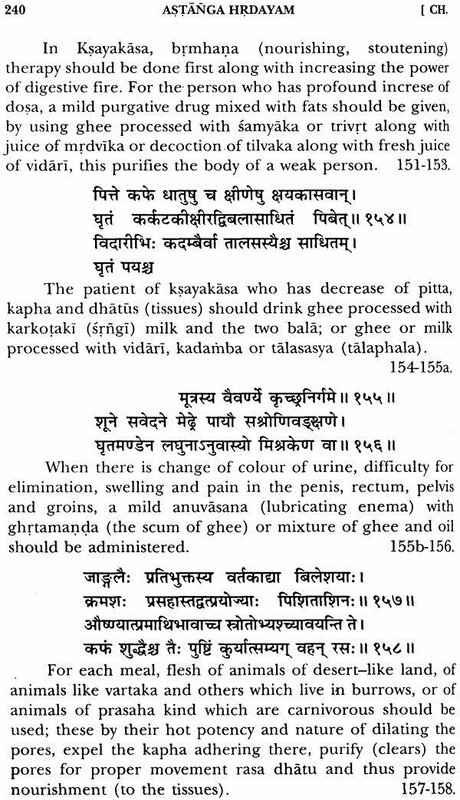 Greater portion of the text being devoted to Kaya cikitsa-(inner medicine) is thus conspicuous. 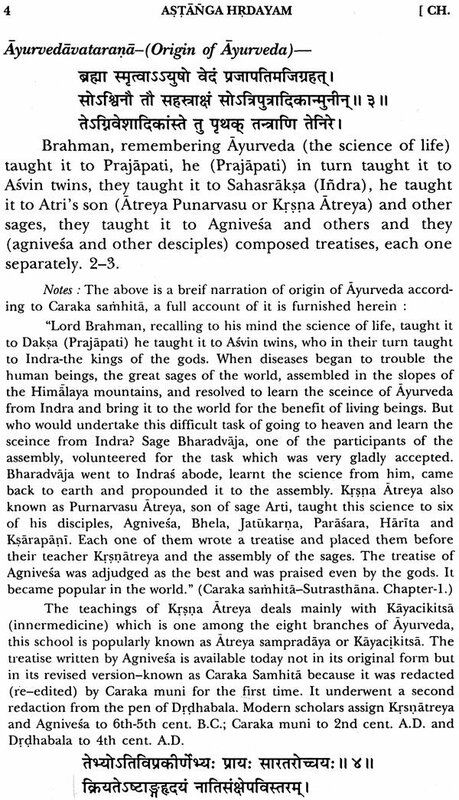 At the beginning of the treatise, the author states "that he is going to describe only such information" as has been revealed by great sages like Atreya etc."' 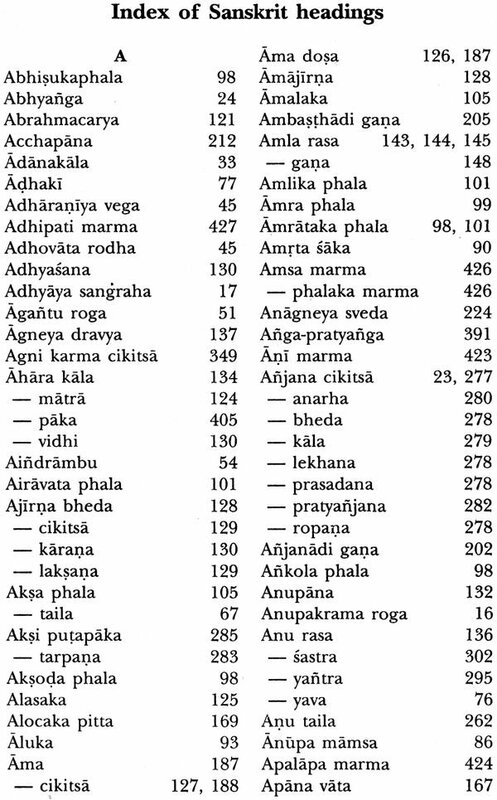 "collecting only the cream of knowledge from numerous texts (written by sages) scattered in the country, this text Astangahrdaya has been prepared which is neither too brief nor too elaborate" These statements vouchsafe the authenticity and reliability of information con tained in the text. 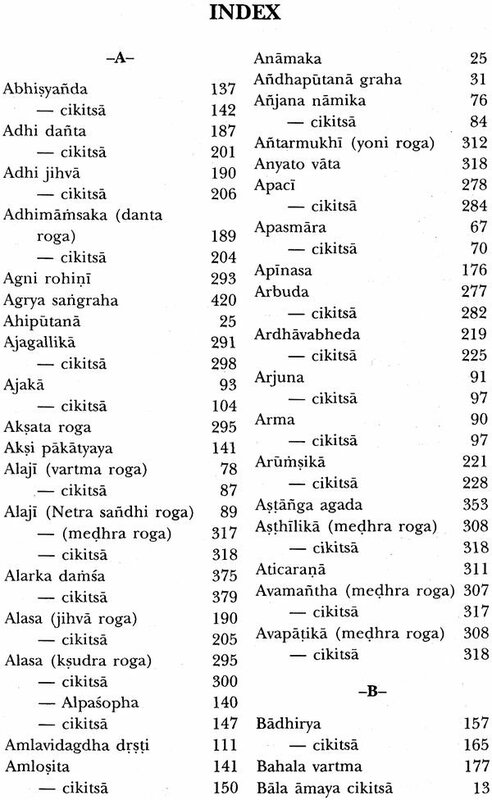 Unfortunately the author of Astanghrdaya has not fur- nished either his name or any other information about him- self anywhere in the text. Hence many of the present day scholars-both Indian and European-have been consistently attempting to identify this author but so far no conclusion has been arrived at. All the views are "the most feasable assumptions" only. The following internal and external evidences form the basis for identification. 1. 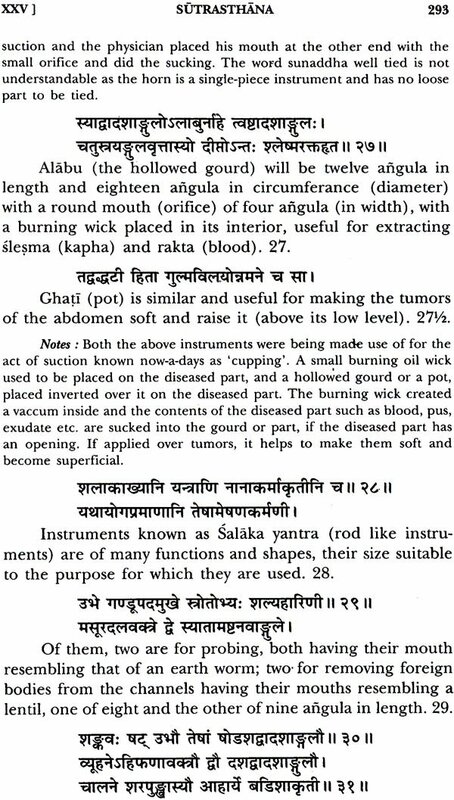 In the concluding verses of the text, the author states "by churning the great ocean of the eight branches of medi- cal science, a great store of nector-the Astangasangraha (name of a treatise) was obtained. 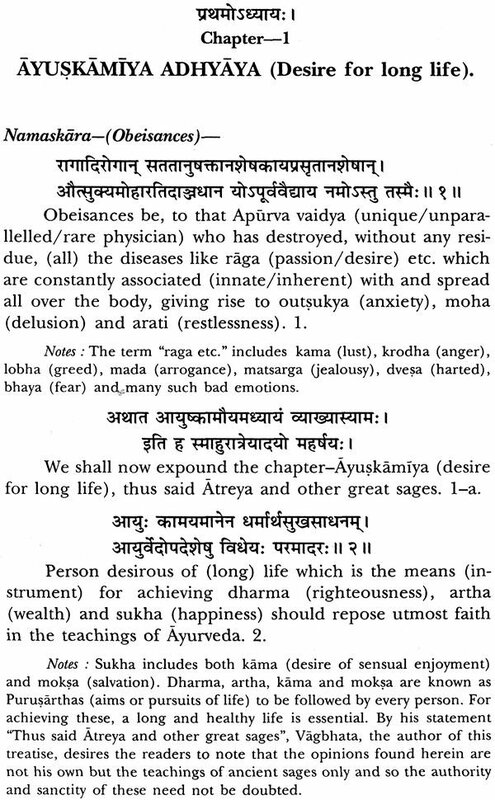 From that store, this trea- tise (Astanga hrdaya) which is more useful, has arisen sepa- rately for satisfying the less studious. 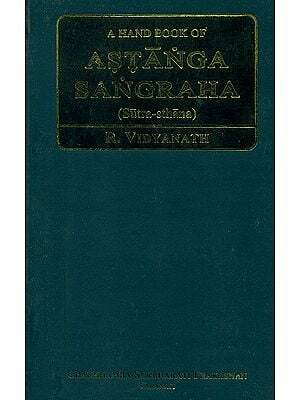 By studying this, the person will be able to understand the Sangraha (Astanga sangraha). 2. 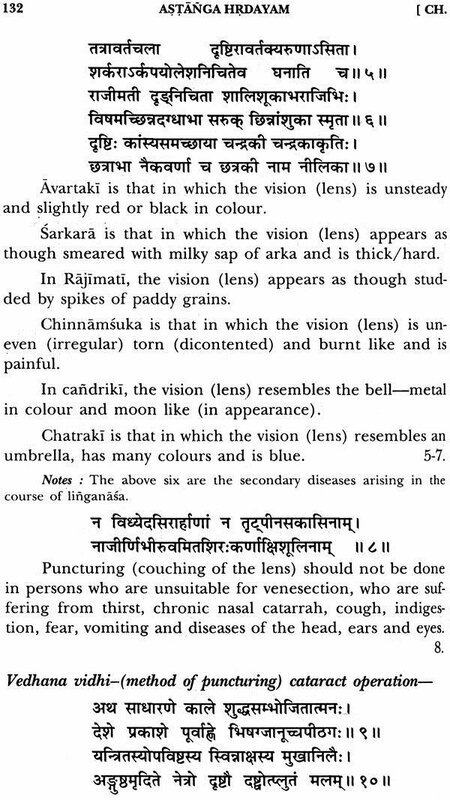 The author of Astangasangraha, has furnished the following information about himself and his work in the concluding verses of that treatise. "There was a great physi- cian by name Vagbhata, who was my grand-father, I bear, his name; from him was born Simhagupta and I am from him (Simhagupta); I was born in the Sindhu country. 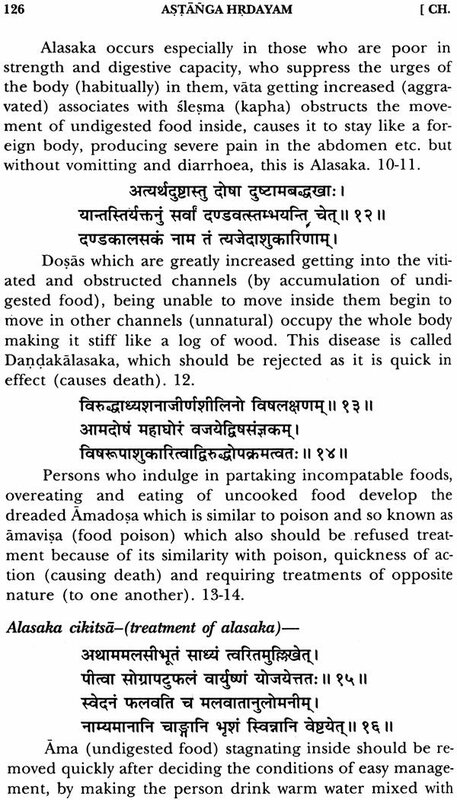 Having learnt the science from Avalokita, my precepter and much more from my father and after studying a large number of texts on this science, this treatise (Astangasangraha) has been written, suitably classified (arranged into sections, chapters ete.) Elsewhere he states that it has been prepared in such a manner as is suitable to the age" (of the author). 3. 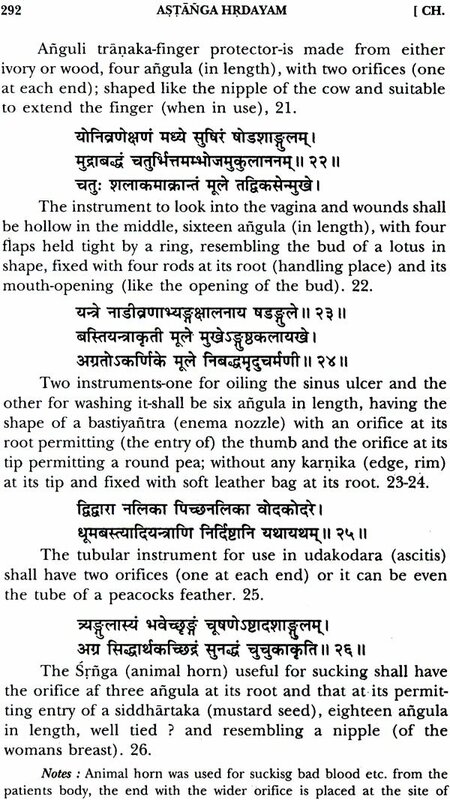 In some manuscripts of Astangahrdaya there is a colophon at the end of Nidana aud Uttara sthanas which reads as "thus ends the Nidana sthana in Astangahrdaya samhita written by srimad Vagbhata, son of Sri vaidyapati simhagupta." But the absence of such a colophon at other places and in some other manuscripts, and the use of hon- orific term "srimad" as a prefix to the author's name have made the present day scholars to doubt the authenticity of the colophon. 4. 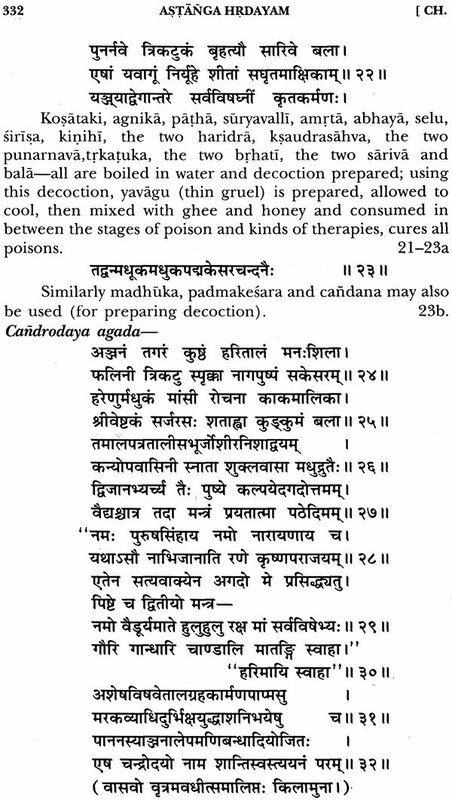 Commentators on other Ayurveda treatises have quoted verses of Astangasangraha and of Astangahrdaya call- ing them as 'from Vrddha Vagbhata' and "from Laghu/ svalpa or (simply) Vagbhata" respectively. 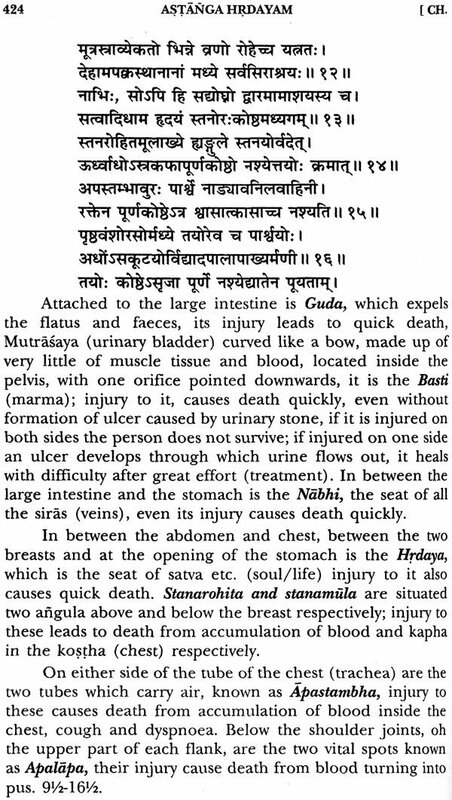 Based on these points, it is now generally agreed that the author of Astanga hrdaya is also Vagbhata. 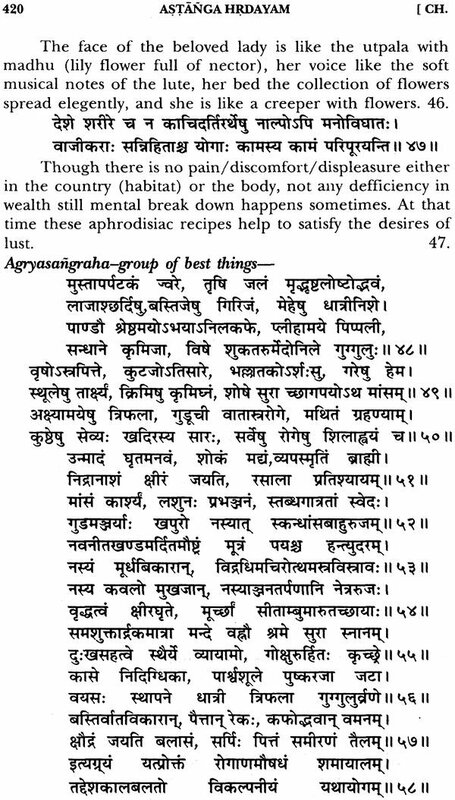 The next problem that has to be solved is whether both Astanga sangraha and Astanga hrdaya are authored by one and the same person Vagbhata, son of Simhagupta or whether the authors are different persons of the same name. This has been a subject of long discussion and has created two groups of scholars. viz. 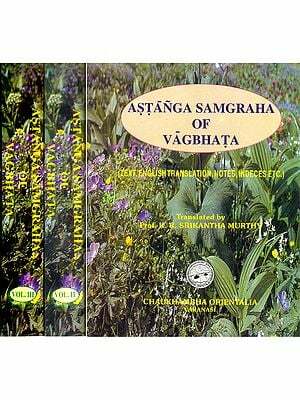 This volume comprises of the Nidana sthana, Cikitsita sthana and kalpasiddhi sthana-the third, fourth and fifth sections of Astangahrdaya of Vagbhata. As usual the text in original and its faithful English translation have been fur- nished. 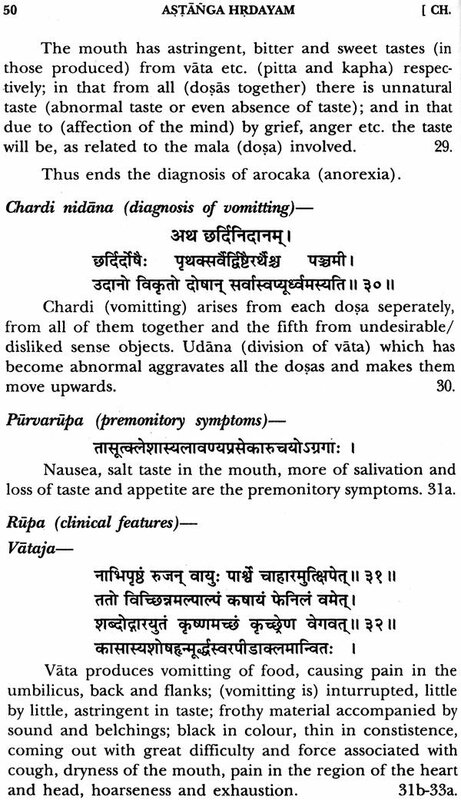 These three sections deal mainly with one branch of Ayurveda, viz., Kaya cikitsa (inner medicine). 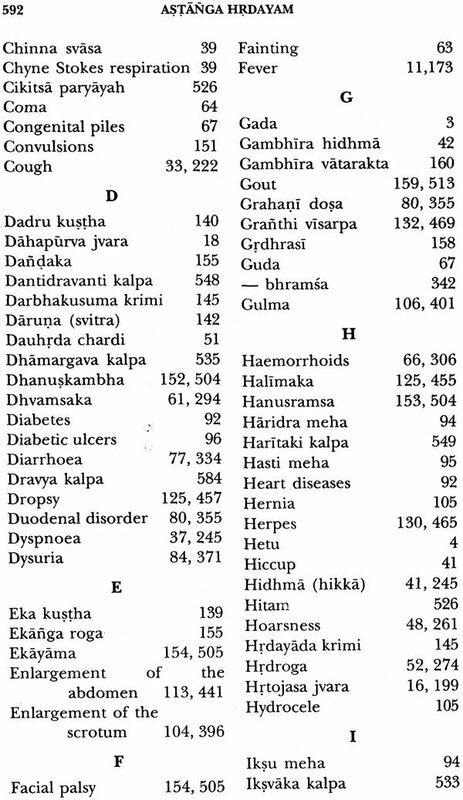 Since the re- maining seven branches will be dealt in the Uttara-sthana the sixth and the last section, consolidated lists of diseases, drugs, etc., will be appended to the next volume. 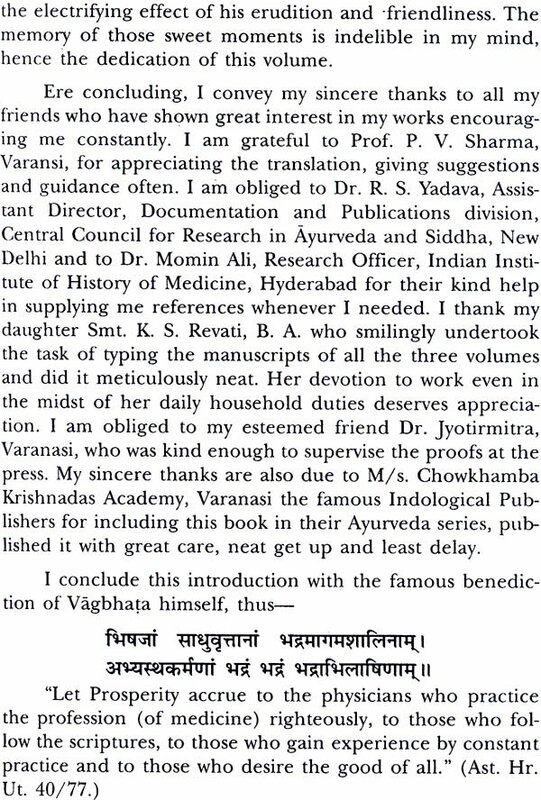 I have dedicated this volume to another preceptor of mine Pandit N.L. 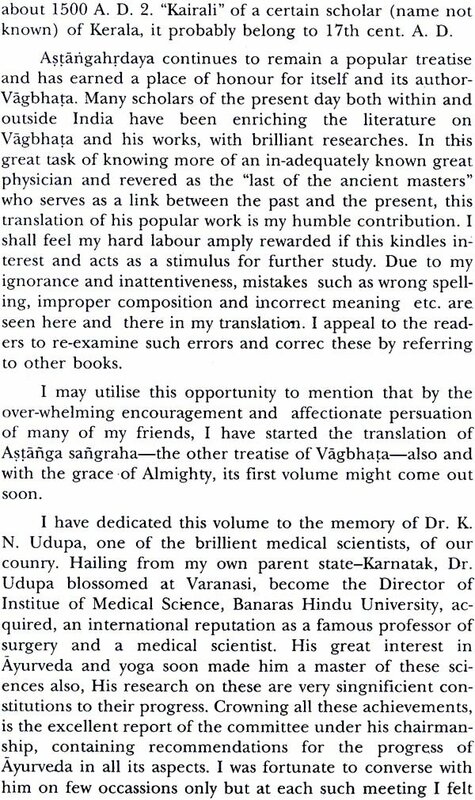 Bhattacharya, who showered his affection on me and who also enriched the literature of Ayurveda in Kannada language; hence a few words here about his life and work. Pandit Bhattacharya (1883-1961) served as Professor at the Govt. Ayurveda College, Mysore (1928-53). With wide knowledge of both Sanskrit and Ayurveda, he could ably explain many moot points in the doctrines substantiating them with textual references. He possessed special knowledge of almost all the herbs and durgs available in the forests and those used by Ayurveda physicians and so was being con- sulted as an "expert" by Ayurvedists, Botonists, officials of the forest department and many others. He was mainly respon- sible for the establishment of a herb garden attached to the Ayurveda College. 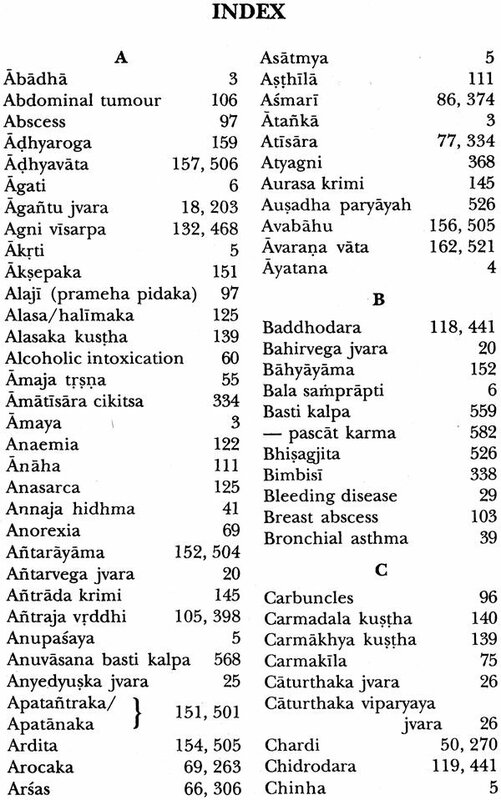 Apart from Dravyaguna vijnana he taught many subjects of Ayurveda and his lecture notes became text- books. 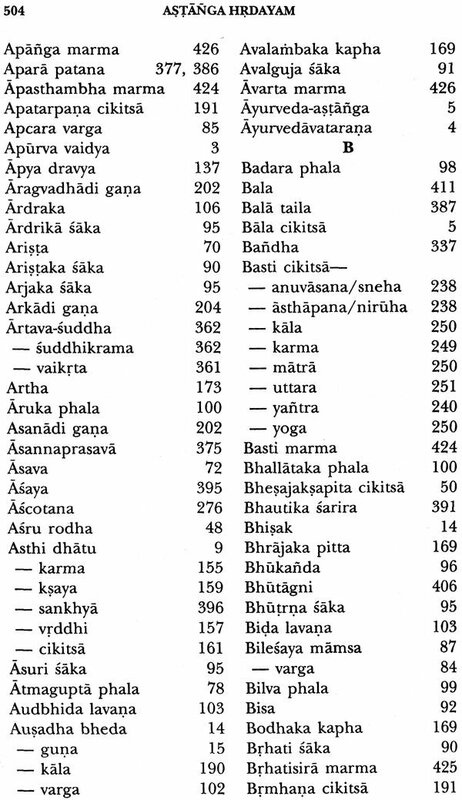 Thus were published the Agada tantra, Sutrasthana of Astangarhrdaya (1956), Prasuti tantra-striroga and Kaumara- bhrtya (1957), the remaining sthanas of Astarigahrdaya and the first part of Susruta samhita (1959). Inspite of advancing age he was able to complete the translation of the second part of Susruta sarnhita and the whole of Caraka samhita. But he did not live to see these in print and all these have been published later. Students of Ayurveda in Karnataka owe a great debt of gratitude to this ideal teacher. I convey my sincere thanks to my friend Prof. Jyotirmitra for containuing his help at the press. I also thank my daughter Smt. K.S. Revathi, B.A. for her flawless typing of the manuscripts. I am beholden to M/s. Chowkhamba Krishnadas Academy, Varanasi, the reknowned Indological publishers for bringing out this volume without any delay. Table 7. (3) -- minerals, metals, salts etc.